Disclaimer: I was gifted the book by the author for a honest review. 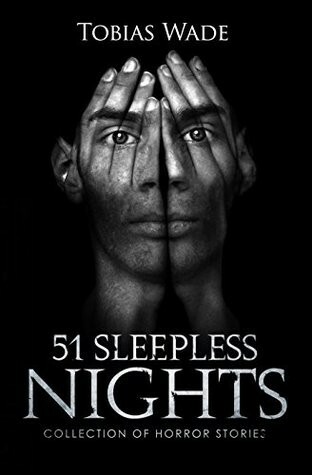 “Horror Stories: 51 Sleepless Nights “ is written by Tobias Wade, former neuroscience researcher and author. ’51 Sleepless Nights’ is an anthology of fifty-one (duh!) horror/thriller short stories involving all kinds of fears including arachnophobia (spiders), changelings, loss of identity, paranoia, demons, serial killers and more. The first horror books that I read were ‘The Exorcist’ and ‘The Omen’; that I read when I was 13 years old ( some blame this for the way I turned out, but that is neither here nor there). I, then, discovered Stephen King, Robert Bloch and other greats, whose books I devoured. But that was 20 years ago. And it has been a long time since i read horror. So, when Tobias Wade asked me to review his book, I jumped at the opportunity. This would break the monotony of the few genres I had become entrenched in and give me a chance to go back to a genre that I had neglected. ’51 Sleepless Nights’ is a very well written book. Writing good horror requires that you have excellent writing skills, since building a sense of paranoia and nameless fear is key to the experience. Tobias Wade is obviously no slouch at this. Most of his best stories in the book involve this building up of tension. In addition, horror writers also need to have a keen understanding of the human mind. Why is this important? Our fundamental fears arise from abandonment, a loss of identity or loss of connection. Which, in turn, translates to our nearest and dearest being the source of our fundamental fears. If you can’t trust them, then whom can you? A fear of disappointing them or letting them down is also a prime motivation. This book has it in spades. For example, in one of the stories, the protagonist describes his personal devil in the following way. “His horns were as sharp as being stabbed by the love of your life after you have sacrificed everything to bring her joy. His face was the burden of holding your dying father in your arms while both of you knew you could have saved him if only you’d tried harder. Powerful imagery. I loved it. I never felt bored while reading it. The only suggestion I have is to have longer versions of some of these stories. I would love to read a novel by this author.